The aim of this study was to compare the effectiveness of (azithromycin) compared to (erythromycin) in prolonging pregnancy in patients with Preterm Premature Rupture of Membranes (PPROM). 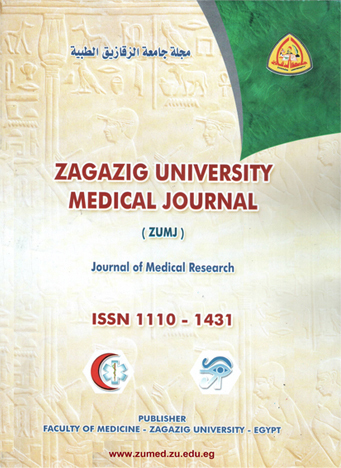 In the present study 162 singleton pregnant women aged 18-40 years old with PPROM between 24 - 32 weeks gestation who were admitted to obstetrics and gynecology department of zagazig general hospital, within 36 hours of rupture of membranes and cervical dilation less than or equal to 4 cm. All patients received corticosteroid in the form of (dexamethasone) 24 mg IM injection in divided doses for 24hours to enhance lung maturity. Patients with known lethal fetal anomaly, vaginal bleeding not associated with labor , maternal or fetal indication for delivery , cervical cerclage in place , placenta previa or other known placental anomalies , use of antibiotic therapy within 5 days or allergy or other contraindications to erythromycin/azithromycin or steroid use were excluded from the study. All patients were randomly classified into two groups: Group І: included 81 patients received Erythromycin 500mg orally every 8hours for 5 days (erythromycin 500, Amirya) and Group ІІ: included 81 patients received Azithromycin 500mg orally every 12 hours for 5 days (Zithromax 500, Pfizer). The participants are completely unaware of which group they are in and what intervention they are receiving until conclusion of the study (single blind study). There were non-significant differences between the two studied groups as regard socio-demographic data, general, local examinations, and both fetal and maternal outcomes. There was high significant difference between the costs of treatment of the two groups, azithromycin is more expensive than erythromycin but this difference has no value in relation to more side effects of erythromycin which were gastrointestinal side effects which were (33 patient in the group in erythromycin in comparison to 17 patient in the group of azithromycin). We conclude that the two drugs show similar efficacy regarding latency and both fetal and maternal outcomes.